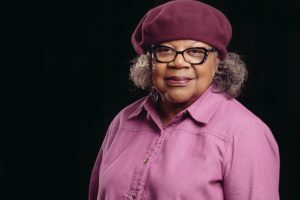 Home / Posts tagged "hartford-stage"
Having THEIR Say: Generations in Conversation is a project initiated by Hartford Stage, inspired by the Delany Sisters. Young Hartford area students interview women about their experiences as African-Americans through the civil rights movement to the present. Sometimes a project comes along that is so important, so special, so different that it changes you forever. It gives you a new perspective on life. It resonates in a way that our everyday projects might not. 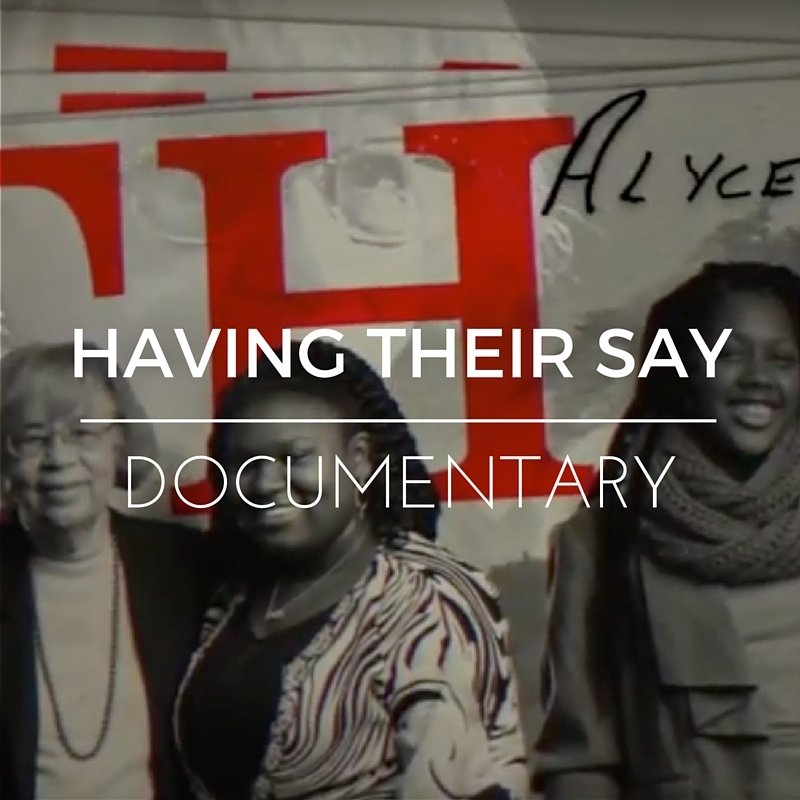 It grabs you by the throat, shakes you and says, “See, you can make a difference in this world; you are making a difference.” For Miceli Productions, a current work, the documentary video titled “Having Their Say: Generations in Conversation,” was one of those moments. 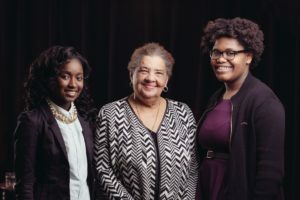 “Having Their Say” is an oral history project initiated by Hartford Stage and inspired by the 1993 book “Having Our Say: The Delany Sisters’ First 100 Years.” For “Having Their Say,” young Hartford area students interviewed 10 African American women over age 70 to share their stories from the civil rights movement to the present. 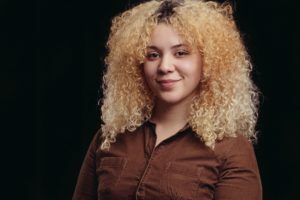 These intergenerational interviews inspired exchanges about personal journeys, experiences and how living in Hartford influenced their lives. The tradition of oral history goes back to the beginning of humans, but the act of recording these oral traditions – first in audio formats and now video – dates back to the 1940s. The recording of oral history gained an especially significant importance in the African American community as many former slaves were illiterate so little written history about their experiences existed. Oral history also brought democratization to the recording of history where not just the elite are included. With oral recordings, the ordinary person can have their say in history. And historians are learning how world and national events affect every person, not just the top politicians and business leaders. Oral history also extends that democratization to the consumers of history. Recorded histories, particularly videos in this internet age, provide ready access to these histories to all people, not just the historians who hunker down in dusty libraries. Portrait of Patricia Wrice (center) with Natalie Best and Elyece Patterson. 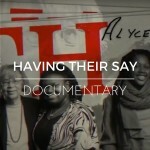 “Having Their Say” will stand as an important example of this trend, as this documentary video and separate videos of the 10 women are being shared through social media, where they will reach a younger audience that didn’t first-handedly experience the struggles that their ancestors lived through to bring basic human rights to African Americans. 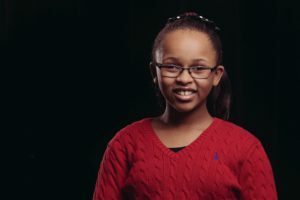 Younger viewers will be drawn into the videos because the interviews are conducted by their peers and they will relate to the reaction of the young interviewers. One of the beauties of recorded oral history is how the interviewer and subject develop a rapport during the course of the interview and the narrative becomes more than just a factual account. The viewer begins to relate to the interviewer and learns along with them about important events through personal stories. The young ladies conducting the interviews for “Having Their Say” obviously are drawn into the lives of their subjects. This experience gives them a new appreciation for the history of their area and respect for the women who served as community leaders during a tumultuous time in American history. 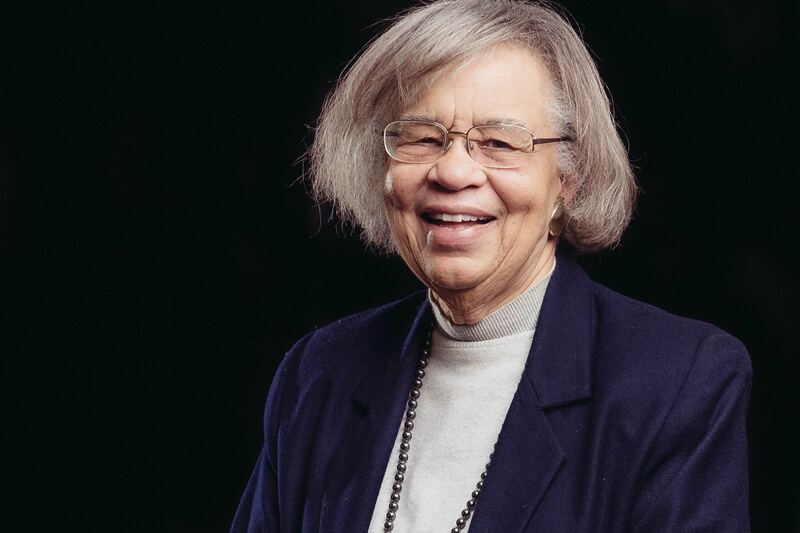 With this inspiration, they likely will become leaders in the Hartford community and even the nation for a new generation of African Americans. Portraits of Patricia Johnson (right) with Miracle Hyde. Miceli Productions is proud of the role we played in this production and pleased with our partnership with Hartford Stage. Having a professional production company involved in this type of history project gives it an added poignancy and production quality that will attract additional viewers. Involvement in the Hartford community is an important aspect of our work as media artists and storytellers, and we look forward to cooperating with other local agencies to produce videos that will not only tell the history of Hartford, but also shape its future and its future leaders. We truly love doing this work. and need professional guidance to get it off the ground. 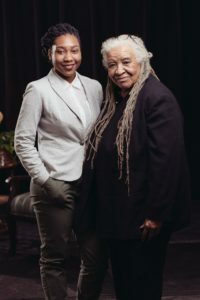 View the 20 minute version of the documentary video HAVING THEIR SAY: Generations in Conversation. AND View the interviews of all the participants. Want more images and Photography by Miceli Productions? For Advertising, Fashion, Product, Travel, Corporate, Portrait, Nature, Fine Art. Miceli Productions captured these images of Hartford Stage Artistic Director Darko Tresnjak for the 2013 Gala Invitation. Keep your hand on the plow, hold on. Come unto me, I am the way. the more you talk, gonna stay on my knees. Be nobody there to put me out. I tried it on at the gates of Hell. 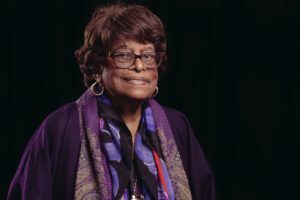 Before Marian Anderson and Paul Robeson, there was Roland Hayes—the first world-renowned African-American classical vocalist. Born the son of a slave, Roland discovered his voice as a young boy singing spirituals in church. 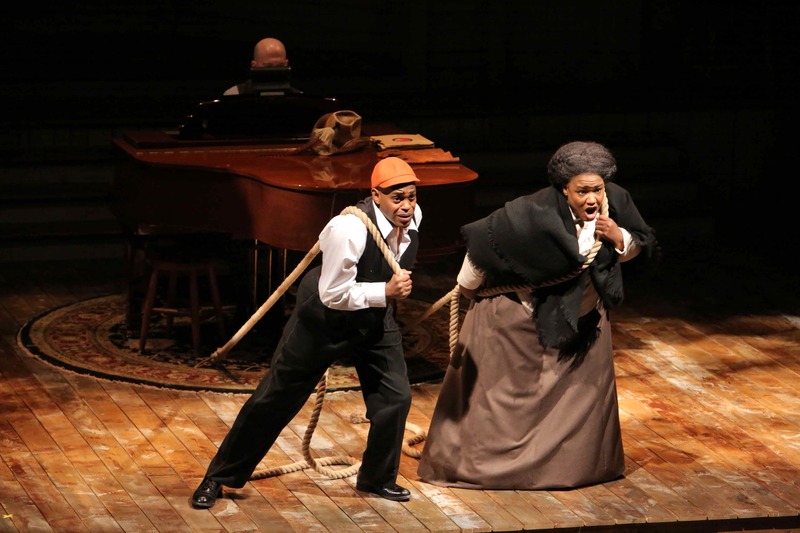 This play chronicles his amazing journey from a plantation in Georgia, to singing before kings and queens in Europe. Breath & Imagination explores the life of an American pioneer through words, movement, spirituals and classical music. Miceli Productions has a long history of creating media content to promote and archive theatrical performances. We regularly capture multi-camera HD video for performance archives, provide b-roll clips to media outlets, record radio spots with our network of voice over artists and create :15 and :30 spots for TV with edited video and by animating a show’s poster images. Hartford Stage’s 2013-14 season opener is a repertory of two plays – La Dispute by Marivaux and Macbeth by William Shakespeare. Very different in style and appearance, each needed content for the theater’s marketing and advertising endeavors. First on our list was creating the radio spot for Macbeth. The second thing we created for Hartford Stage’s marketing of Macbeth was the :15 TV Commercial. We took the graphic art for the show, added some motion graphics for a little interest, sourced the voice over – add music and you get creepy TV spot! Miceli Productions can help you advertise and market your brand. Got a project in mind? Give us a call (203) 936-7761. A masterpiece of world literature, Shakespeare’s swift and relentless tragedy uncovers the terrifying consequences of blind ambition. In medieval Scotland, a savage world of ghosts, witches and bloody battlefields, a dark prophecy leads a warrior and his wife past the point of no return. Featuring Kate Forbes (The Crucible) as Lady Macbeth. Miceli Productions has a long history of creating content to promote and archive theatrical performances. We regularly capture multi-camera HD video for performance archives, provide b-roll clips to media outlets, record radio spots with our network of voice over artists and create :15 and :30 spots for TV with edited video and by animating a show’s poster images. 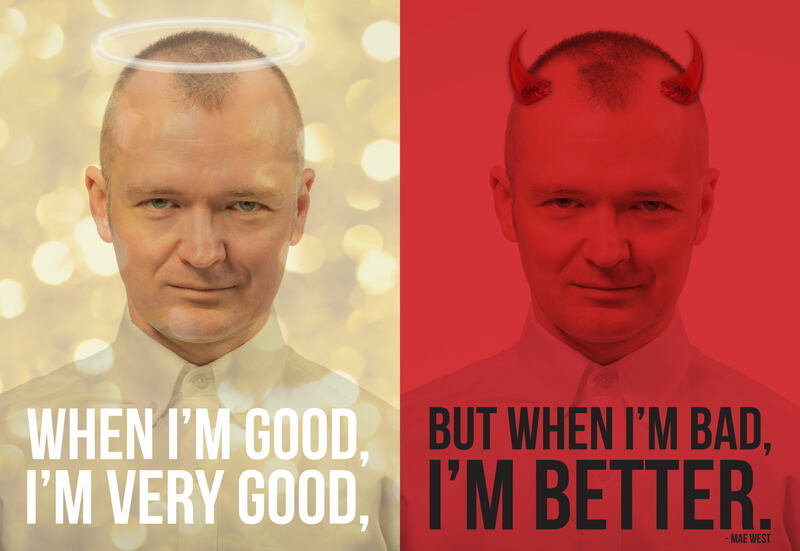 The second thing we created for Hartford Stage’s marketing of Macbeth was the :15 TV Commercial. We took the graphic art for the show, added some motion graphics for a little interest, sourced the voice over – add music from the show and you get creepy TV spot! Since we archived the performance, we were also able to pull still clips from the archive video to add to the :15 spot. We sourced the voice over and sent samples to the Client for approval, then mixed the VO with music from the show and audio effects. The result is a product that we can use for both the radio spot and the upcoming :15 TV commercial, maximizing Hartford Stage’s investment in content creation. More importantly, we can do all of this in-house in our Studio and deliver content electronically anywhere in the country. We’ve worked with theater’s across the country to produce content that helps sell their shows – from Cleveland to Philadelphia to road shows (like ELLA: The Musical) that travel everywhere. Every industry has technical terms. And you may have heard the term “b-roll” used by PR types. But what exactly is b-roll? And why might it be important to have b-roll footage ready to use? We’ll spare you the history lesson of where the term comes from but give you the contemporary definition: b-roll is supplemental video footage. It can be used for cutaway shots that help tell a visual story. It can be footage of your company, event or organization that can be used for press and news footage. It’s also used in documentaries and films. You see it when a video cuts to a supporting shot while a person is describing something, or when an editor cuts out an anecdote or run-on sentence and replaces it with a succinct visual that tells the story more quickly. Having high quality b-roll packages can be helpful if you need ready-to-use footage for press coverage or events. If you anticipate TV news coverage, you may want to have a b-roll package ready. There is less disruption to your office by a TV camera crew, the basic footage is available any time you need it and producing your own b-roll gives you the ability to control the quality of the video. Most footage can be delivered electronically, so it’s easily accessible to anyone who may request it. It can become part of your online newsroom and press coverage to share openly with your followers. As an example, check out Facebook’s videos and b-roll in their online newsroom. 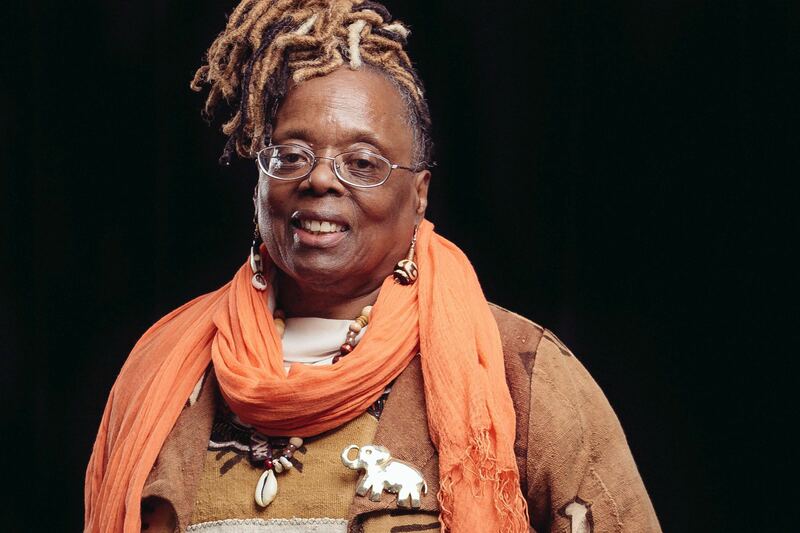 Or check out a favorite b-roll clip we shot to promote Hartford Stage‘s GEE’S BEND. 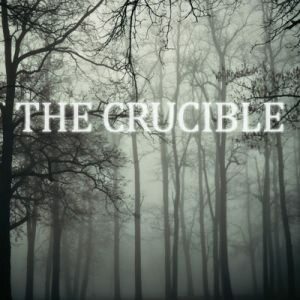 Check out the TV commercial Miceli Productions created for Hartford Stage’s upcoming production of The Crucible. We started with the marketing image (below) provided by the client and then dug in with 3D animation to bring to life this haunting story of persecution and false accusations. The performance opens September 1, 2011. To see more examples of TV commercials produced by Miceli Productions visit our TV commercials playlist on our YouTube channel. Alfred Hitchcock, legendary film director, known for his unmistakable personal silhouette and use of shadow in film noir (not necessarily in that order) is the inspiration of the latest TV commercial in our studio. Hartford Stage’s upcoming production of “Alfred Hitchcock’s The 39 Steps,” adapted by Patrick Barlow and directed by Maxwell Williams, provided Miceli Productions HD with an opportunity to be inspired by the visuals of Hitchcock’s films and create original digital media with the current cast at Hartford Stage. Michael Miceli worked with actors Robert Eli, Steven French, Christina Pumariaga, and Noble Shropshire to create original photographs with iconic murder mystery silhouettes and scenes. Combining this original digital photography of the actors, creating silhouettes in Photoshop and animating these images into HD video, we were able to create an original TV commercial spot paying homage to Hitchcock but 100% representative of this production. View the TV commercial below. For more background on Alfred Hitchcock, spy novels and adapting “The 39 Steps,” check out Hartford Stage’s new online version of Stage Notes. Miceli Productions HD recorded original HD footage with three cast members of Hartford Stage Company’s production of Snow Falling on Cedars to communicate the intense story of this stage adaption of David Guterson’s #1 best selling novel. In this 30 second TV spot, we asked the actors to experience the range of intense emotions their characters feel as the story of Kabu Miyamoto’s trial unfolds in an isolated Puget Sound community. Media elements include original HD footage from a dedicated on-location shoot and composites of that footage with background plates from the play’s scenic designer Takeshi Kata. SNOW FALLING ON CEDARS playing at Hartford Stage January 13 – February 13, 2011. Cast: Kimiye Corwin, Sean Cullen, Bill Doyle, Dashiell Eaves, Ted Koch, Kate Levy, Tom Mardirosian, Ron Nakahara, Mia Tagano, Brian Tee, Mark Watson, and Alexandra Hoffman Beechko. Patrick VanHorn from Giant Bicycle says…..
"I hired Jennifer Blessing Miceli and Miceli Productions, LLC, to produce a short, thought-provoking, professional video for our website. The results were superb -- and on-time and on-budget. I will definitely hire this production team again."